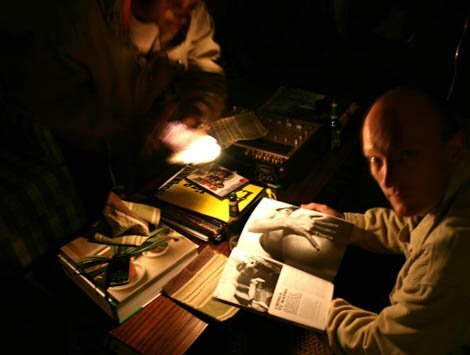 I asked the editor in chief of South Africa's premiere arts journal to give up electricity for 24 hours, and provided him with 2 street-hired laborers and a dozen hand-crank generators. Doin’ my part to lighten the load began with my emailing this proposal to Carine Zaayman, the exhibition curator. With her approval, it went on to O’Toole, and the art work continued as an expressed relationship between its performers. My interest was in highlighting, unpacking, playing with and antagonizing the layers of hierarchy between real people with varying degrees of symbolic capital, financial influence and sociopolitical authority, within a specifically South African context. What does it mean for an artist to ask so much of a critic? What kinds of relationships will emerge between us, between O’Toole and his hired hands, between each of them as they get tired or their generators break, between the group as a whole? What kind of dialogue - spoken or unspoken - does this work instigate in post-Apartheid South Africa; against the backdrop of contemporary art; in relation to the failing electrical grid and the politics of electricity at large; as a scenario put forward by an American-born South African artist currently living in Europe? In our ongoing correspondence, what is brought to the fore about South Africans’ real and perceived a priori relational structures? Over the course of the project, I may have: temporarily disrupted power in the (art) world; offered a small space to tell stories (and I hope O’Toole will follow up with the “labourers”* regarding their work); explicitly exposed some assumptions around who and what each of the participants are and how we navigate with and relate to others; implicitly done the same with regards to more general art world persona categories, as well as South African ones; (indirectly) given O’Toole a migraine; and had some fun being daft and serious and engaged and open-ended all at once. *The artist-”labourers” were Lungi (Mlunghisi) Konghisa, printmaking assistant and labourer, 071 411 7788, and Steven Mabuela, designer, rapper and labourer, 079 272 4861; project management and photos by Brendan Copestake.